Landscape lighting can enhance your residential outdoor living space or commercial landscaping. Even a little lighting can go a long way toward highlighting your landscape features and improving your curb appeal. Outdoor lighting showcases beautiful landscape design and adds depth and dimension to your business or home in the twilight and evening hours. In addition, you add safety and security to dimly lit areas. 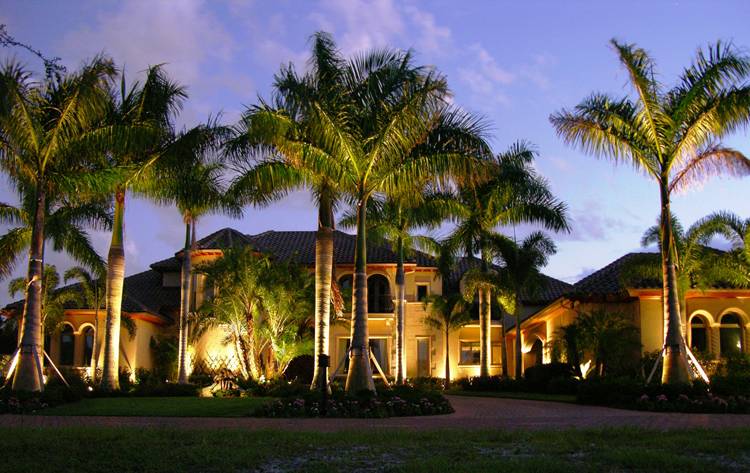 At Crawford Landscaping, we understand the beauty and functionality of landscape lighting. We know proper lighting choices and placement can create just the right feel, from simple and subtle to bold and extraordinary. We added Crawford Landscaping’s Lightscaping Division in 2010, to assist clients in getting the most out of their landscape design. Our lightscaping specialists work with clients to showcase carefully designed landscape. They can recommend the type, style and location of lighting to meet your needs. You would probably be surprised to learn the number of choices you have when it comes to landscape lighting. Having a professional help you will be beneficial. There are a variety of lightscaping options in the Naples and Fort Myers, FL area, depending on what you want to accomplish. No matter if your goal is security or beautification, or both, you have several ways to achieve your goal. Here are a few landscape lighting options you may want to consider. · Uplighting: A common type of lighting you see outside businesses, resorts and even homes, is uplighting. Uplighting creates a dramatic effect highlighting interesting trees, statues or textured walls. · Downlighting: You can also choose the opposite of uplighting, which, of course, is downlighting. Downlighting, or area lighting, involves mounting lights in trees or on a house or building to illuminate wide areas such as flowerbeds, paths or steps. · Accent or Spot Lighting: Accent, or spot lighting, focuses a controlled intense beam of light to highlight focal points such as flowers, small shrubs and statues in a garden. · Pool and Fountain lighting: Lighting in or around pools and fountains creates dramatic effects as the water reflects the light. As you can see, there are many forms of landscape lighting. Choosing the one that’s best for your landscape isn’t an easy choice but our designers can help. You can learn more on our website or call us for a free lightscaping demo kit at 888.581.5151.